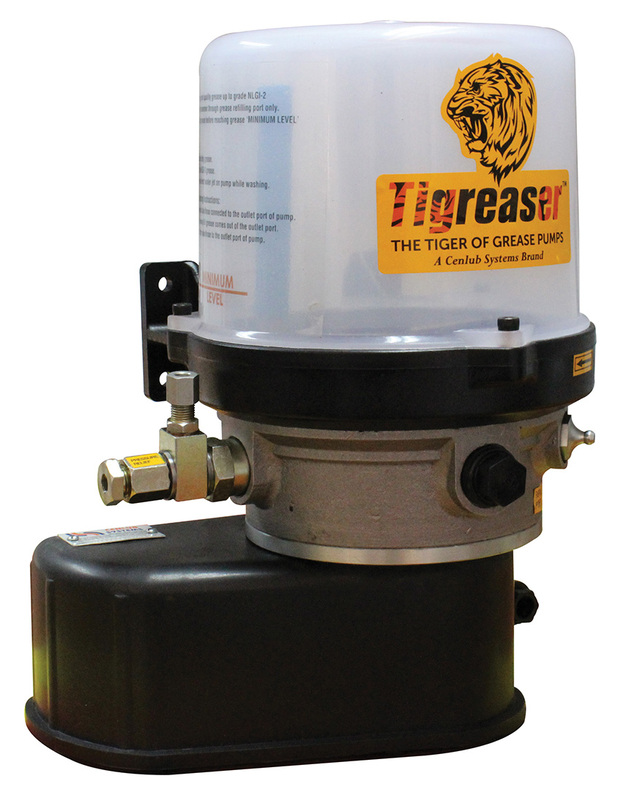 These are our 4th Generation 24VDC grease pumps with majorly plastic body, elegant design and international looks. These are lighter, compactor and more economical than earlier MGL and Tigreaser Series. They come with a provision of an extra pumping unit in comparison to MGL series and can accommodate upto 4 pumping units in a single pump. These pumps are meant for Industrial Applications like Power Press, Printing Press, Injection Molding Machine, Ginning Machine, etc. C02301S00812 TG ECO-24VDC-03-01-NS 350 Bar Yes 24 V DC 1 3 litres Polypropylene No 4 cc per min. C02301S00813 TG ECO-24VDC-03-01-LS 350 Bar Yes 24 V DC 1 3 litres Polypropylene Low Indication 4 cc per min. C02301S00814 TG ECO-24VDC-03-02-NS 350 Bar Yes 24 V DC 2 3 litres Polypropylene No 4 cc per min. C02301S00815 TG ECO-24VDC-03-02-LS 350 Bar Yes 24 V DC 2 3 litres Polypropylene Low Indication 4 cc per min. C02301S00816 TG ECO-24VDC-03-03-NS 350 Bar Yes 24 V DC 3 3 litres Polypropylene No 4 cc per min. C02301S00817 TG ECO-24VDC-03-03-LS 350 Bar Yes 24 V DC 3 3 litres Polypropylene Low Indication 4 cc per min. C02301S00818 TG ECO-24VDC-03-04-NS 350 Bar Yes 24 V DC 4 3 litres Polypropylene No 4 cc per min. C02301S00819 TG ECO-24VDC-03-04-LS 350 Bar Yes 24 V DC 4 3 litres Polypropylene Low Indication 4 cc per min. C02301S00820 TG ECO-24VDC-05-01-NS 350 Bar Yes 24 V DC 1 5 litres Polypropylene No 4 cc per min. C02301S00821 TG ECO-24VDC-05-01-LS 350 Bar Yes 24 V DC 1 5 litres Polypropylene Low Indication 4 cc per min. C02301S00822 TG ECO-24VDC-05-02-NS 350 Bar Yes 24 V DC 2 5 litres Polypropylene No 4 cc per min. C02301S00823 TG ECO-24VDC-05-02-LS 350 Bar Yes 24 V DC 2 5 litres Polypropylene Low Indication 4 cc per min. C02301S00824 TG ECO-24VDC-05-03-NS 350 Bar Yes 24 V DC 3 5 litres Polypropylene No 4 cc per min. C02301S00825 TG ECO-24VDC-05-03-LS 350 Bar Yes 24 V DC 3 5 litres Polypropylene Low Indication 4 cc per min. C02301S00826 TG ECO-24VDC-05-04-NS 350 Bar Yes 24 V DC 4 5 litres Polypropylene No 4 cc per min. C02301S00827 TG ECO-24VDC-05-04-LS 350 Bar Yes 24 V DC 4 5 litres Polypropylene Low Indication 4 cc per min.